Managed Internet Access Service provides ASA clients Internet Protocol (IP) access to the Internet using dedicated, symmetric, Ethernet access in bandwidth ranges from 10M to 10G. Managed Internet Access Service includes a client location, ASA managed router that, in addition to providing network routing functionality, provides SNMP data used to monitor the availability and performance of this service. The client interface will be either copper or fiber based Ethernet, depending on client equipment and distance between client equipment and ASA managed router. Each Managed Internet Access Service client is connected to the AREN backbone via contracted Ethernet transport service provider (AT&T, Charter, etc.) 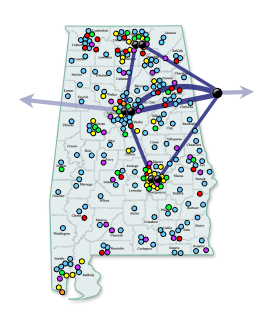 connections and routed to one of two AREN Internet egress locations (Birmingham and Atlanta). ASA provides its clients total service responsibility including the contracted Ethernet transport.